I don't remember how I first ran across this, but I thought it was so neat that NASA Astronaut Karen Nyberg did some quilting in space! 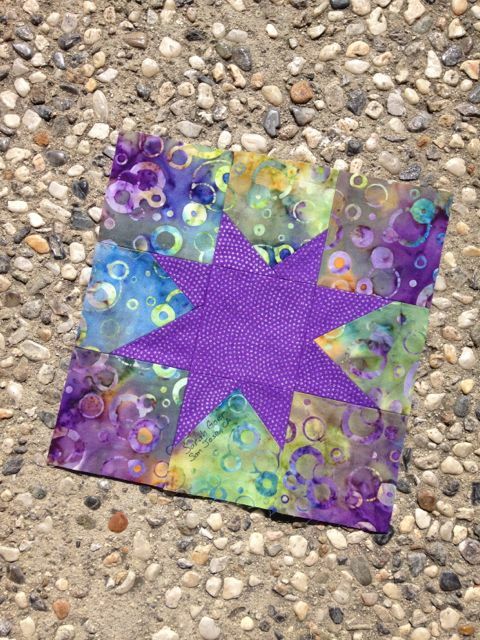 A challenge was created for quilters to submit their own star blocks to be combined with hers to create a quilt that will be displayed at the 2014 International Quilt Festival in Houston. I like a challenge. The Astronomical Quilts! Block Challenge went on my to do list. 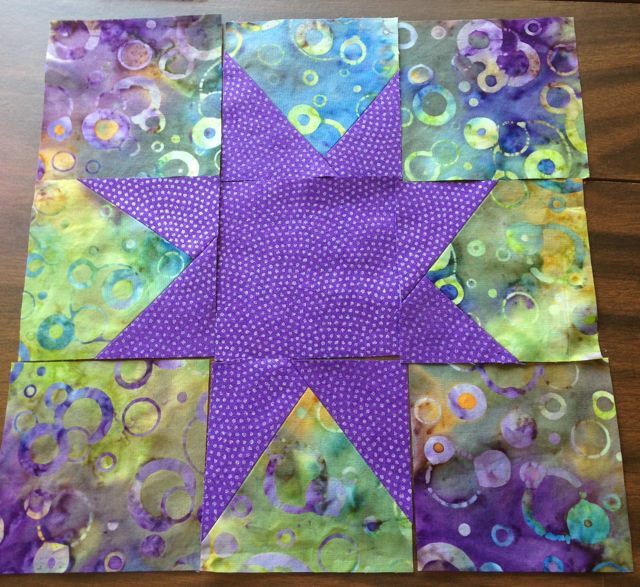 The challenge was to create a star-themed 9.5" unfinished block. I like a deadline, because I'm a procrastinator. If I could have found that August 1st was a postmark deadline, I'd still be procrastinating. But last night I did the math and decided I needed to get that block sent off priority mail today to make sure it arrives by the 1st. So today while The Boy was at Summer Camp and The Girl amused herself, I cranked out a block to submit. A couple weeks ago, I saw Terri Faust's post about her Astronomical Block. It's beautiful! 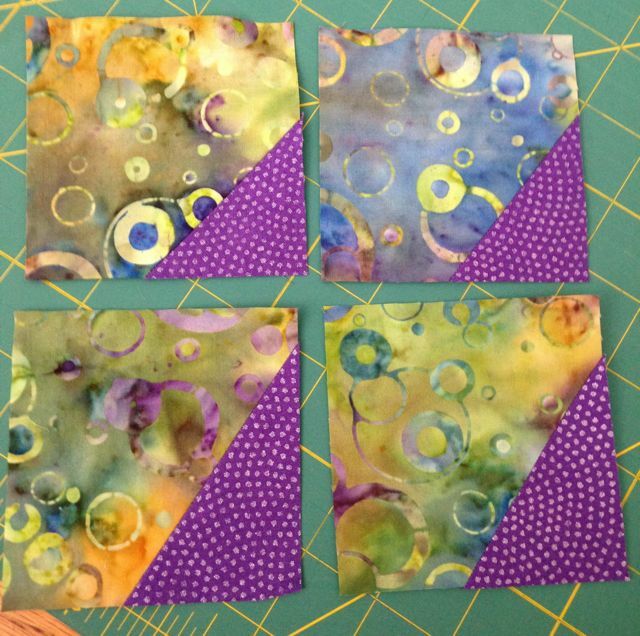 And her lovely background fabric inspired me... it reminded me of a fabric from my stash. Then today when I pre-washed my fabric I made my friend Amber decide what my second fabric should be. Yay! The hard decisions were made! I knew I didn't have time for anything too intricate, so I decided on a wonky star block. Once the fabrics were chosen, washed and ironed, it took me about a half hour to cut and piece the block. It was my first wonky star block and I really liked the process. 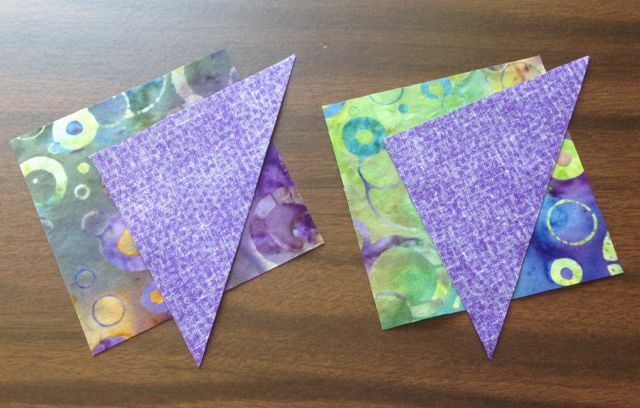 I cut all my pieces: nine 3.5" squares of the background (one unused) and five 3.5" squares of the star fabric, 4 of which were cut into HSTs. 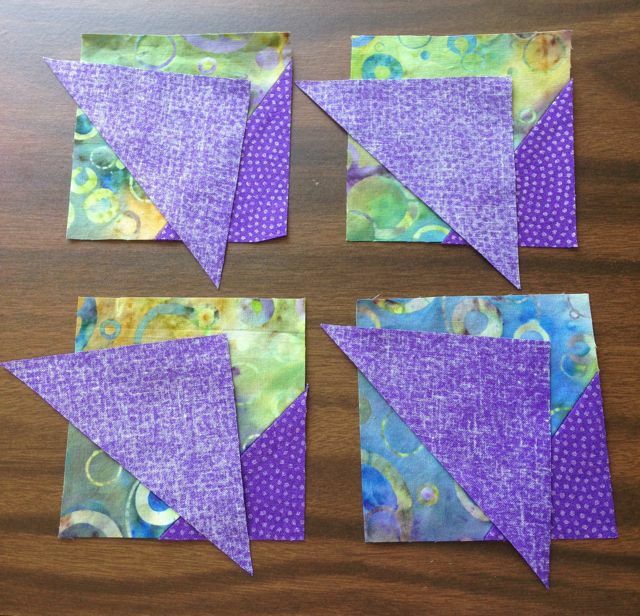 Decided on random angles to attach blocks... stitched 1/4" from triangle edge. Trimmed background to 1/4" seam allowance after sewing. Added the second set of wonky points. Press them open again after sewing, then trim. Then decided on a layout before piecing the 9-patch together. I'm very happy with how it came out. I might have been more sad to mail it away just three hours after finishing it if I didn't have 2-3 yards of each of these fabrics left in my stash. I think a new project is making it's way into my queue. 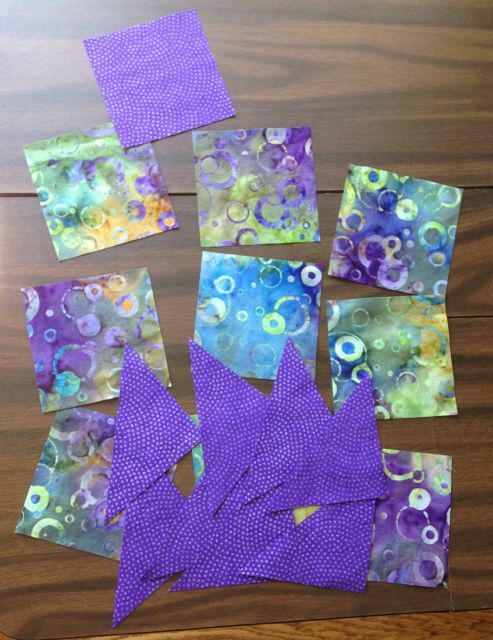 Update: See my lap quilt, Stellar Wind, that was inspired by this block. 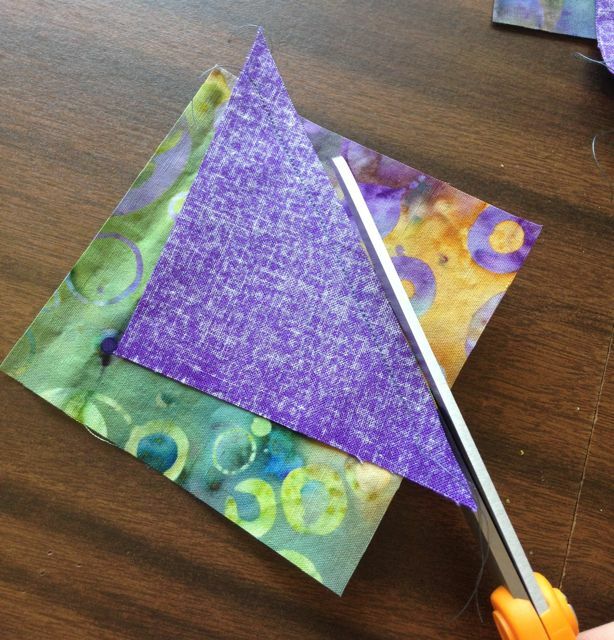 I'm linking up on Freemotion by the River and Sew Fresh Quilts. Posted in Quilting. 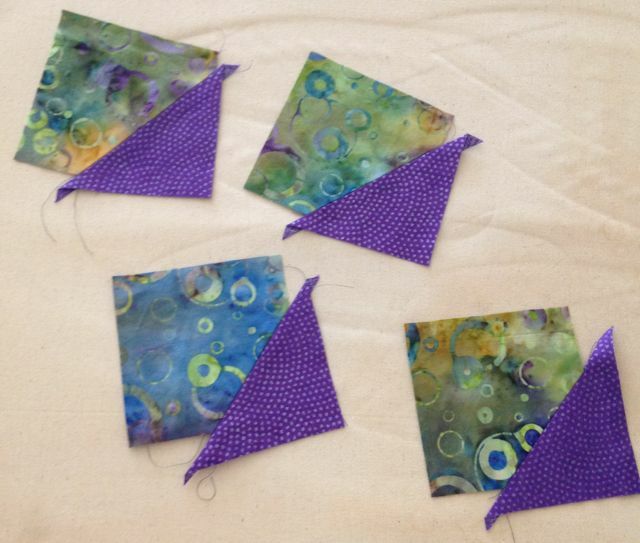 Tags: challenge, wonky star on July 29, 2014 by sarah. I love a wonky star. Well done for getting your block done on time! Thanks. Wonky stars could totally be my new addiction! Lovely star block, Sarah! I can see why you are tempted to keep going with those blocks. Looks like fun! Thanks so much for sharing all your in progress pictures. So inspiring! That background fabric is stunning. Looks great! Thanks, Katie. I can't bring myself to put it away, so I ironed the rest of the yardage this morning so I can cut it up for a new project. Thank you, Stephanie. Your block is lovely! Great colors! !